Blue Man concerts are quite awesome and so I was interested to find that there is a Blue Man fragrance available. I added bay rum essential oil to make it a truly masculine scent. 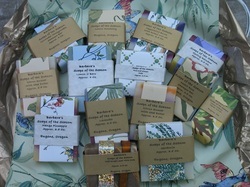 It's now one of our most popular soaps at the Eugene Saturday Market. Definitely worth trying!